Guys, it's still full on WINTER here! As I type this I can glance up and see mounds of snow and it's COLD. Even though we had a taste of spring we have been confined to the indoors, and I am getting STIR CRAZY. I am so ready to shed these layers and see green. Unfortunately in Central Wisconsin, the weather can be extremely unpredictable. I moved back awhile ago, so you would think I would get used to it, but I just can't! I decided that I would bring the outside indoors and enjoy 'spring' the best way I know how... with flowers! This is quite literally the easiest piece of art work I have ever made. They make a great statement at the new studio! For beautiful pressed flowers, gather clean flowers free of spots or blemishes. Try collecting them on a sunny day when they are not wet from rain or dew. Place the flower face down in a telephone book lined with parchment paper. Close the book, weigh it down, and leave undisturbed for seven to 10 days. You will want to check to make sure all the moisture is gone and your flower is papery. 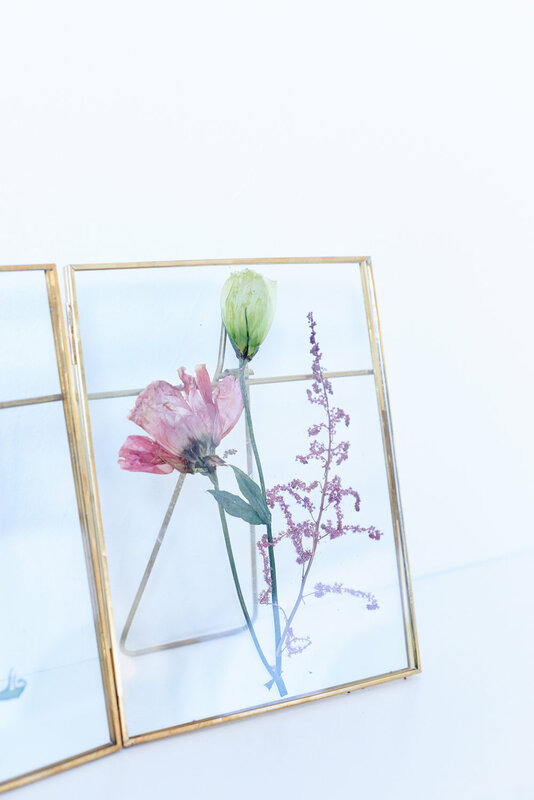 Once you have the flowers flattened you just place them in the frame! It's that easy! You may need to cut them to fit. Feel free to pull off petals if they are too thick to close the frame. And there you have it! Gorgeous art work. Enjoy! Photos by The McCartney's Photography.